Vern Burkhardt (VB): In The Business Model Innovation Factory you describe a business model as "…the story of how value is created, delivered, and captured." Would you explain? Saul Kaplan: Most of us take our business models for granted because we've been living in our business models for so long. We don't really talk about it very much, but it's important to be able to describe your business model so that you can begin the conversation about what business model innovation is and how you re-invent it. A business model involves three things. It's about creating, delivering and capturing value. Let me take each one. It starts with how you're going to create value. Who are you going to create value for, and what value are you going to create? I like the Clay Christianson construct of the jobs to be done as a way to frame what your value proposition is, or how you're going to create value. What problem are you trying to solve in the marketplace? What job is your customers trying to do that you're going to help them do better? So the first step is the value proposition, or how you're going to create value. The second step is being able to articulate how you're going to deliver this value. How do you get it to your customers? What are the capabilities that you need to have in place or to partner with in order to deliver value to your customers, and then to scale it so you can deliver value to any number of customers. It starts by answering how you're going to deliver value to a single customer, and then expands to answer the question of how would that scale so you could deliver comparable value to many customers simultaneously. The third piece is how you capture value. It involves capturing value in order to create the resources necessary to sustain and grow your business. Every organization needs resources deployed in order for it to run and to do work. Do you charge for your product and make money this way? Do you charge for a service? Do you have a one price fits all subscription model? If a nonprofit organization, do you raise money through philanthropic donations or other contributors to your organization? It's about a story. A business model is a story of how you create, deliver, and capture value. VB: Does a focus on 'jobs to be done' help clarify our thinking? Saul Kaplan: Totally. One of the biggest challenges faced by most organizations, which know they need to reinvent their business model, is that they have trouble changing their lens. We tend to think through the lens of our existing business model or organization. When we're looking for new products or services we naturally think about them from the perspective of our organization. Thus we miss opportunities to deliver value because we're constrained by our own business model. What we really ought to do is flip this around and see the world through the lens of our customers. We need to understand our customers' experience. We need to understand the job they're trying to do and then begin to think about how we're going to help them do it better. By changing this perspective we open ourselves up to potential new business models, and thus we can potentially avoid being disrupted by someone else who does. If we're stuck thinking through the lens of our current business model and not able to adopt the view of our customers in order to design new business models this way, we're vulnerable to someone else who is able to do so. And for sure they will disrupt us. This is what's happening more and more to organizations. VB: It's happening at an ever-escalating pace as well. Saul Kaplan: Absolutely. The life of business models is declining. They don't last as long as they used to. In the old days CEOs and other leaders of organizations didn't have to change their business models. They could run their entire careers and spend their entire time focused on how to improve performance. Today the business models don't last as long so the real challenge for a twenty-first century leader is how to improve the performance of the current business model while at the same time beginning to envision, design, prototype and test entirely new business models. This even includes those that might disrupt the existing one. It's hard to do, but if you're not thinking this way you're going to be more and more vulnerable to being disrupted. VB: You say all organizations have a business model, including businesses, nonprofits, government agencies, and even individuals. Even individuals? Saul Kaplan: Yes. I started down the path of thinking about business models through the lens of corporations because that's where I spent a lot of my early career – within industry and then as a strategy consultant traveling around the world. But then I had an interesting opportunity to become an 'accidental bureaucrat'. I worked in government for about 6 years and for the first time in my life and career I thought about innovation, not through the lens of a corporation, but through the lens of a community. Rhode Island where I live is an interesting place to do this because it's the smallest state in the U.S. It enables you can see the whole movie. You can see the way the pieces fit and work together, whether it's private sector business, government leaders, or university presidents. All of us know everyone by name, and we see the way these parts can work together or the way they don't. So I've become quite convinced that business models apply across the board, not only to companies but also to organizations in the public and social sectors. We need to figure out how to play with the parts more easily across those silos. Then I began to think about us as individuals. I have come to the view that if we want to transform anything, whether it's an organization or a community, we had better start by talking about how we transform ourselves, how we reinvent ourselves. In the twenty-first century we need to become comfortable with the idea that we're going to have to reinvent ourselves several times over the course of our lives. They don't teach us how to do this in school or even when we get out of school, so we have to learn these skills and how to apply these tools through other means. Individuals have personal business models in the way they create, deliver, and capture value. Today your business model might be about being an employee in a large corporation where you deliver certain work and for this effort you get paid a salary. Tomorrow you might find yourself in a position where you need to be a free agent or an entrepreneur learning how to deliver and capture value in a completely different way. I've spent a lot of time thinking about personal business models, and about how we need to put ourselves into a position where we can reinvent ourselves. VB: Is it about making a lasting contribution? Saul Kaplan: Yes. Virtually all of us want to do work that is meaningful and makes a difference, in whatever context we do our work. It's a shame when people are doing work, which they don't think is meaningful and making a difference, but they need to keep doing it because it's how they pay the bills. We only do our best work when we're really passionate about it. We need to learn to light a fire in people and help them get better connected both within and outside of our organizations. If we don't we're going to see a lot more organizations getting disrupted and also having trouble holding onto their talent. VB: "Storytelling is a critical element of any successful business model innovation effort." How does this work? Saul Kaplan: If you believe as I do that people do their best at what they're passionate about, and they don't do as well at things they're not passionate about, then the trick is to have what we call an "inspiration accelerator". It's about how we inspire those around us – and ourselves – to follow a common passion or a shared purpose. It doesn't matter whether you're a company, school, government agency, or you're trying to change your community. It's all about how we inspire each other, and leverage our connections and ability to share information and to work together more effectively. Story telling is one of the most important tools of any innovator. How do we convey our ideas in a story which creates an emotional connection for people? If we can see ourselves in a story we are more likely to want to sign up and participate in it. I'm a lot more likely to buy your product or service. I'm a lot more likely to collaborate or want to connect with you if we share stories with each other. In this sense storytelling is essential for business model innovation. At the Business Innovation Factory, which I founded about 8 years ago, we spend a lot of time thinking about how do we create, package, and share stories amongst each other. And its not just stories at the end of completing a task. It used to be that marketing, public relations, and communications were the keepers of stories. They were responsible for shaping, packaging, and sharing the message. They only shared the story when the project was done, and the organization was ready to announce a new product with a big launch meeting. It's the world many of us grew up in. The new world doesn't work this way. Now businesses exchange information and stories every single day, and their stories are more generative. Story telling is less about the pretty bow and the press release at the end, and more about the story of the work you're doing and how you're doing it. You are sharing it in all of its glory across multiple social media platforms and through different formats in order to try to get to people to connect and engage in the story. The hope is they will participate directly in the story and help you make it better. This is how movements get started. Today it is much more about creating and launching movements than creating and launching companies. If you can form a movement which people are passionate about and therefore they want to connect with it, you're going to be more successful at getting people to not only buy your products and services but to tell their friends and their friends' friends. Story telling is an important tool for this. VB: So the splash announcement about a new product, such as Apple does, is not the formula for future success? Saul Kaplan: Watch the way Apple does this. You're right; they're close to the vest and protect what happens at the end but look at all the stories that abound leading up to their announcements. They get many people talking about their new products before being introduced to the marketplace. It's amazing the story telling that's going on, and Apple's ability to create a huge splash at the end. We mostly know what it's about by the time the launch meeting actually happens. There are incredible numbers of conversations and speculations being shared prior to these launches. It's interesting to watch. VB: The key is that there be a conversation about the story? Saul Kaplan: Absolutely. We need to enable our customers to participate in the story around our products and services. It's less of a push model where we would create the stories and push them out to the marketplace. It's much more of a pull where our customers are able to create the best stories about their experiences in our communities, and with our companies. We have to get far better at engaging our customers in story telling – absolutely. VB: In your experience are most business leaders able to tell the story of their current business model using easy to understand words irrespective of the language they speak? Saul Kaplan: No. Most organizations have been pedaling the bicycle of their business model for so long they completely take for granted the story of their business model. When I ask people across a company to tell me the story of their business model, a lot of people don't know what a business model is so our conversation starts there. Even if they do know I get inconsistent stories about it, which is understandable. If you haven't had to change your business model, and all you're worried about is the effectiveness of your current business model, you don't focus on telling the story of your business model. Story telling is important internally just as much as it's important externally in the marketplace. If you want to create a new business model, get people to embrace it, and encourage the people in your organization to move into a new or different business model, you had better be good at story telling. You better be good at helping people understand how they fit into the story, and how they can engage and participate in it. VB: You have to guard against using an organization's internal jargon. Saul Kaplan: Yes. I talk about getting below the buzzwords. If you want people to relate to the story you need to tell it in a way that people can relate to it. Don't use jargon which people can't get emotionally connected to. Talk in English, or whatever your native language is, and tell personal stories. Be vulnerable. This is hard for a lot of organizations to do because they want the story to be perfect and polished before it gets issued. I advise leaders to put the story out in unvarnished and genuine ways while it's being generated, and let people help you make it better. Let people tell you early on when the story's silly and wrong. Just think of all of the big companies which spend tens of millions of dollars creating a new campaign only to find out on launch day that the crowds in the social media hate it and have viscerally reacted negatively to it. They have to take down the entire campaign within 48 hours after spending lots of time and money. They probably did market research, but it was the traditional market research that didn't give them insights into how people were likely to react and participate in the story. Why not put the story out while it's an early idea and see if you can create some traction and build on it. This will give you some incredible progress toward getting to a compelling story. If it works you'll already have a built-in audience of people eager for what you have to offer. VB: You advise that your current business model can become a straightjacket leading to failure. How does this work? Saul Kaplan: Business models are straitjackets, and I don't necessarily mean this in a negative way. They're straitjackets in how they define the way you create, deliver, and capture value today. Once the rules, customs, incentives, and roles and responsibilities are made clear so everyone in the organization knows how they fit into the current business model the last thing you want is for all of this to change. The idea is to execute the business model, and it's a good thing. If you have a good business model and it can scale, you want great clarity on what everyone's role is and how people are to work together. You don't want everybody to be worried about how they're going to transform your current business model. You want people to be worried about how they're going to work together to meet the objectives of the business model. This is different than designing an entirely new business model. It's particularly scary if the new business model is one that might disrupt the core business. If you're going to organize around a new model you have to organize and lead differently than the way you organize and lead for the core business model where you generally want to make incremental improvements. Over the years I've learned that you have to be really clear about what your innovation agenda is. Be specific about your expectations and the objectives of your efforts. If your objective is to improve the performance of the current business model, then say so. Make that objective explicit, and then organize around it. Don't expect you're going to get entirely new business models from that exercise. If you want to design new business models make that explicit and clear. The organizational effort will be very different than the focus on incremental change to the current business model. VB: Are many of the business leaders you deal with aware of the danger that their organizations may be "netflixed?" Saul Kaplan: Yes. In my book, The Business Model Innovation Factory, I write about why business model innovation is the new imperative and why companies don't do it, and I provide some principles and a road map for how to do it. I use the example of Blockbuster and Netflix in the book, which most people recognize and can relate to. Blockbuster had a clear business model. It was a bricks and mortar model where customers went to rent videos of their favorite movies, and this model scaled beautifully. It was a huge enterprise with 5,000 stores. But that business model was not designed to take advantage of DVD technology, where DVDs could be mailed directly to someone's home. Blockbuster had DVD's but they put them on the shelf as a product in their bricks and mortar store. Netflix came along and implemented an entirely new business model. They delivered DVDs to customers' homes so they didn't even have to go to the corner store anymore. Blockbuster couldn't get out of its own way. They were stuck in their current business mode. Netflix took off, grew rapidly, and completely disrupted Blockbuster. Ultimately Blockbuster went out of business. I use the verb 'netflixed' as in 'to netflix' a business. I don't think anywhere near enough leaders understand how vulnerable they are to being netflixed. They are not putting in place the platforms and tools necessary to avoid being netflixed. This involves experimenting with new business models while strengthening the current one so that instead of being netflixed they can be doing the Netflix thing to others. It's about playing offense instead of defense. VB: Can you imagine companies like Apple, Amazon, Google, or Craigslist ever being netflixed by a disruptive technology and new business model? Saul Kaplan: Yes, it's important to recognize that business model innovation is not a one-time exercise. You're going to have to be constantly exploring new business models. I talk about it in terms of doing R&D for new business models. In the same way today we do ongoing R&D for new products and technologies we need to learn how to do R&D for new business models. We should have an ongoing portfolio of projects exploring potential new business models all the time. Even Netflix is vulnerable to being netflixed and, in fact, they are struggling mightily with the next format, which, of course, isn't DVD but rather streaming video. Now customers don't even need DVDs to be mailed to them. All they need is enough bandwidth to stream the content to their computer screens, iPads, or even iPhones. Netflix itself is trying to avoid being 'netflixed', and the movie is still out on this question. They've had some pretty interesting difficulties in moving to a new business model because it appears they waited too long to do it. It's going to be interesting to see whether they're going to be able to be the leader and define the marketplace in the streaming space. VB: "Business model innovation is about creating next practices." How is this different than 'best practices'? Saul Kaplan: Best practices are about replicating other peoples' practices in order to improve the performance of your current business model. Companies have become good at incremental improvements to the capabilities or practices that are part of their existing business models – the way value is delivered to customers. I call these 'tweaks'. It's about how to do a better job of what they do. They know how to scan the environment to look for 'best practices', and to benchmark themselves against these 'best practices'. Firstly, they look at other companies in their own industry and then they may look at practices outside their industry. Mostly they're looking at practices that they can dial into their current business model in order to improve its performance. Business model innovation is more about "next practices." It's not trying to find practices to improve what you're doing today. It's trying to find the next generation of practices or new practices that can unleash entirely new business models. Many organizations don't have the right balance. They spend too much time trying to copy existing practices, and not enough time trying to invent the next practice or figuring out ways to deploy practices in entirely new and different ways. VB: You use the terms 'market makers' and 'share takers'. How are they relevant to business model innovation? Saul Kaplan: Most of the world is comprised of what I call 'share takers'. Share takers understand the industry and markets they compete within. Their whole reason for being is to do it better than the next guy. It's about taking one more share-point away from a competitor, or protecting their current share from being stolen by another competitor. Share takers engage in the important competitive activity of understanding how they stack up relative to others in the markets they compete in, and how to improve their ability to increase their share of that marketplace. There are far too few 'market makers' and too many 'share takers'. A "market maker" creates entirely new markets. Instead of trying to figure out how to compete in an existing market – being #4 and trying to move to #3 – 'market makers' say, "We want our own market. We're going to create the market and lead in our own market. We're going to constantly create new markets because, if we do, we can define the way that market works and achieve higher price points. We might have fewer customers but we're going to have more loyal customers who are willing to pay more for the experience, product or service. And then we're going to grow that market because we have the lead position in it, and the economics will be favorable for to us to do so." This century screams for 'market makers', whether it's in the corporate world or in social systems like education, health care, or entrepreneurship. In these areas we need more 'market makers' who are not satisfied with making incremental improvements to the way things work today. We can create entirely new markets that take advantage of technology in more disruptive ways and thereby open up entirely new solutions to the problems we face. This is what it's going to take to be effective in the twenty-first century, whether it's improving the performance of a company, or improving value within our communities. VB: When talking about creating value you say, "Understanding value through the lens of your customers is the best way to create a compelling value proposition." You advise that value propositions should be short; one of the examples you give – Zappos – contains only 3 words. Why should they be short? Saul Kaplan: They need to be understandable. People need to be able to relate to them. A value proposition doesn't mean anything if it looks like a corporate committee prepared it, and everybody had to add some words in order to make sure their function or area of the company was represented. I'm sure you've seen those types of descriptions. They don't say anything to anybody. They don't answer the questions, "How am I going to solve a problem for a customer? What value am I creating? What's the unmet need that I fit into?" I'm constantly trying to get people to simplify their value propositions. It's important to be able to clearly express your value proposition, and to make it plain enough so people can understand what it is. If so they can relate to it. VB: In reference to the question of how your organization delivers value you say, "Don't underestimate the importance of creating a shared operating vision…" Would you talk about this? Saul Kaplan: If we're going to work effectively together to deliver value in a new way to our customers we've got to all get on the same page about how it's going to happen. We have to know how our capabilities complement each other, and the way we fit into the story. Having a shared view of the way we're going to deliver value to our customers is really important. Otherwise what you have are functional silos that don't know how they fit together to deliver value to the end customer. Many organizations need to get much better aligned around this. My favorite operating models are no more complicated than sketches on the back of a napkin. They are pictures which depict how we deliver value to customers and where customers fit in. Then everybody who looks at the sketch can experience an emotional connection, and with great clarity know how all in the organization are together going to deliver value to customers. The napkin sketch may mean nothing to someone who is not in the company. It should mean everything to the people who have to work together to make it happen, and that's what's important. VB: It helps to keep people in the organization focused on delivering value to customers. Saul Kaplan: People feel really good when they understand how they fit into the picture of how value is delivered to customers. Many organizations have gotten so large and functionally fragmented that the people working in them forget how they fit into this picture. They either never knew or have forgotten it. It's hard to be passionate about what they do if they don't know how their contribution fits into the total equation. If they don't know they won't feel like they're part of an integrated whole. Business models are less about organization charts and more about pictures of operating models which give great clarity to how we're all going to work together to solve our customers' problem. VB: "Business model innovation is really just learning how to combine and recombine capabilities in new ways to deliver value." How does this work? Saul Kaplan: The secret to business model innovation is being able to play with the parts. All you want to do is figure out what capabilities are available to you. If you are allowed to play with those parts in a different way than the way they are currently deployed in the business model, you can probably create better ways to deliver value without inventing anything new. Too many people think innovation is about invention, that they've got to create something novel or new. It might be that they just need to recombine the capabilities in a different way. I don't think Netflix invented anything new. They just combined capabilities in a different way to deliver value to their customers, and Blockbuster didn't have the flexibility to play with the parts. They had all the capabilities, but couldn't play with the parts because they were too rigidly stuck within their current business model. It's about having a sandbox to play with the parts in a different way. I describe this as a 'business model innovation factory'. VB: Is this so you avoid being stuck in your current mental model? Saul Kaplan: It's both a mindset and a model. There's a set of rules and processes for how those capabilities get deployed. When somebody comes to you and says, "What if we did it another way?" you will likely get 8,000 reasons why you can't do it that way. In a sandbox, which can explore new business models, there aren't any constraints or there are as few constraints as you can possibly muster regarding how you play with the parts. This is what business model innovation is about. Give me the autonomy to play with the parts, let me demonstrate to you that there are new and different ways to deliver value, and then we can decide whether or not we can scale it. This will help us decide whether we should change our existing business model. But you have to let me play with the parts first. Author Saul Kaplan tells us that business models don't last as long as they used to, and the twenty-first century we need to increasingly be concerned about being disrupted by new business models making our organization's products and services obsolete. This is an important warning for leaders of organizations. Another of the many tips is we need to focus on improving the story underlying our business model if we wish to have employees who are passionate about their organization and be able to clearly communicate to our customers how we can provide value to them. My conversation with Saul Kaplan will be continued in another IdeaConnection Newsletter. Look for it under the title '"Innovation Junkies." 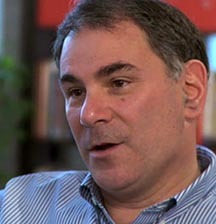 Saul Kaplan is the founder and Chief Catalyst of the Business Innovation Factory. He started BIF in 2005 with a mission to enable collaborative innovation. The non-profit is creating a real world laboratory for innovators to explore and test new business models and system level solutions in areas of high social importance including health care, education, entrepreneurship, and energy independence. Prior to focusing on business model and system level innovation at the Business Innovation Factory Saul Kaplan served as the Executive Director of the Rhode Island Economic Development Corporation and as the Executive Counselor to the Governor on Economic and Community Development. He created Rhode Island's unique innovation @ scale economic development strategy aimed at increasing the state's capacity to grow and support an innovation economy, including an effort to turn the state's compact geography and close knit public and private sector networks into a competitive advantage. Prior to his state leadership role in economic development Saul Kaplan served as a Senior Strategy Partner in Accenture's Health & Life-Science practice and worked broadly throughout the pharmaceutical, medical products, and biotechnology industry. He also spent eight years working for the Pharmaceutical Division of Eli Lilly and Company. As a Marketing Plans Manager, he assisted in developing the launch strategy and successful introduction of Prozac into the U.S. market. He shares his innovation musings on Twitter (@skap5), his blog (It's Saul Connected) and as regular contributor to the Harvard Business Review and Bloomberg Business Week. He holds an MBA from Rensselaer Polytechnic Institute focusing on the strategic management of technology and a BS in Pharmacy from the University of Rhode Island. Saul Kaplan is the author of The Business Model Innovation Factory: How to Stay Relevant When the World is Changing (2012).